On Wednesday, former president Barack Obama and former first lady Michelle Obama joined members of the South Side community and local politicians for an unveiling of the design for the Obama Presidential Center. 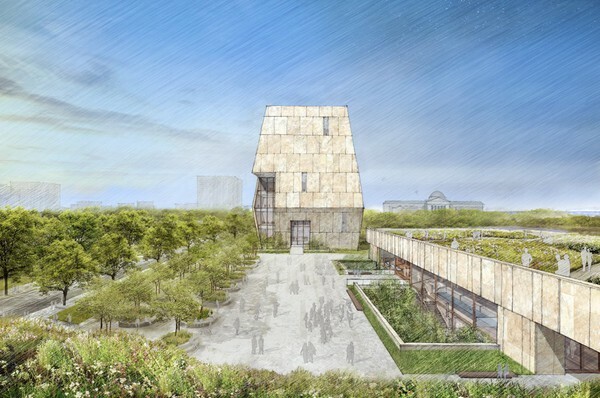 The eye-catching 180 feet tall museum will be the tallest of the three buildings that make up the Obama Presidential Center, providing room for exhibition spaces, public spaces, offices, and meeting rooms. The Obama Presidential Center will feature three buildings on its campus – a museum, forum and library. Large pathways transitioning from the park to landscaped roof terraces will allow visitors to take in the surroundings of Jackson Park. Adjacent to the museum will be the forum and library, each a single-story structure with a rooftop terrace. The forum will house the Obama Foundation offices as well as an auditorium, restaurant, and public garden. The library will be the first presidential library to fully digitize a president’s unclassified records. The Foundation is still exploring how the library can meet community needs, including the possibility of establishing a branch of the Chicago Public Library on site. The buildings will surround a public plaza, forming a campus that integrates seamlessly with the landscape of Jackson Park while being stationed a short walk away from the Museum of Science and Industry. 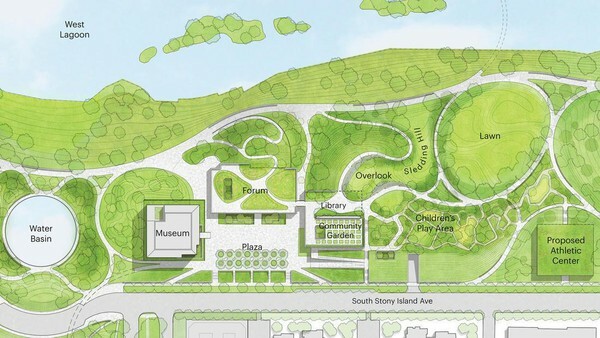 Located North-West of Jackson Park, the Obama Presidential Center will blend seamlessly with the park’s landscape and revitalize Jackson Park’s history as a public gathering place on the South Side. Among other local politicians, in attendance at the event were Fifth Ward alderman Leslie Hairston, Chicago mayor Rahm Emanuel and—as the president joked—the University of Chicago Hospital OB/GYN who delivered his daughters. “President Obama never lost touch with his home, Chicago. And Chicago never lost touch with President Obama,” Emanuel said in his introduction. "The best things that have happened to me in my life, happened in this community," Obama said. 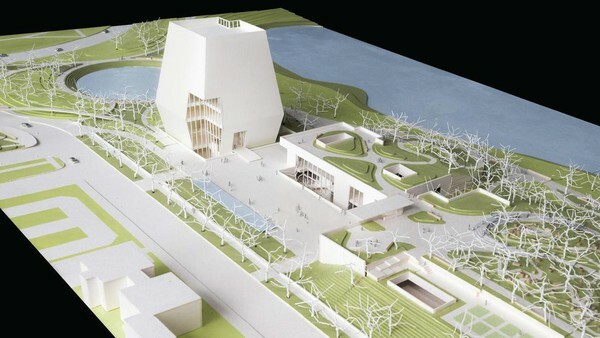 "Although we had a formal bidding process to determine where the presidential library was going to be, the fact of the matter was it had to be right here on the South Side of Chicago." The first look at the conceptual plans of the Obama Presidential Center comes at a time of increasing tension between the community and the Foundation. Community leaders from surrounding neighborhoods are concerned over gentrification effects, and have been pushing for a Community Benefits Agreement (CBA) that will legally bind the Foundation to resolving potential community displacement by providing free after-school programs for CPS students, and developing black-owned, neighborhood-owned and locally-owned businesses among other initiatives. In his hour-long talk, Obama did not mention the potential for a CBA. He says the plans for the Center are not final, and the Obama Foundation will continue taking input from the community. In his speech, Obama preemptively addressed the concerns of the community by highlighting the benefits he hopes it will feel after the center’s construction is complete. The Foundation estimates that the Obama Presidential Center will bring, in addition to temporary construction jobs: 200 permanent jobs within the center, 2,000 in the surrounding neighborhood, and 5,000 in the greater economic area. Obama proceeded to outline several ideas the Obama Foundation has envisioned in partnership with the community, such as inviting community artists, filmmakers, and musicians like Spike Lee and Chance the Rapper to host workshops, setting up barbecue grills, potentially building an underground parking garage on Midway Plaisance, stationing food trucks serving tacos in Jackson Park, and having paddle boats in the lagoons. “I don’t want [the center] to be something kids get dragged to for a field trip, going ‘I have to write an essay about the center,’ then leave.” Obama said. Obama said that he didn’t want to wait four years for the construction to be complete to see change, and announced a personal donation of two million dollars to summer jobs programs on the South Side, which will help train employees so they can be hired upon the Center’s completion. “The Center will strengthen the economic climate of the community by bringing hundreds of thousands of visitors to the South Side every year, creating new jobs and opportunities on the South Side, and revitalizing historic Jackson Park,” stated the Foundation in a statement released to the media. “It is a good thing to have people coming here,” Obama said to community leaders, citing economic and safety improvements that resulted when areas like the South Loop similarly experienced an increase in visitors during the ’70s. The former president also addressed the concern community leaders have with the necessary closure of Cornell Drive in order to make room for the Center. “I don’t want everybody to get so fixated on the traffic— which is solvable— that we lose sight of what is possible” said Obama, citing traffic studies that revealed the road closure adding a maximum of one to three minutes of transit time. "You can't have little kids playing right next to the road. You can't have sledding into the road." The Obama Presidential Center is scheduled to be finished in Jackson Park within the next four years. Community programming through the Center will begin over the summer. The framework plan includes designs for the Obama Presidential Center, a golf course restoration and merger, and consequent roadway renovations.